Before Luke Skywalker blew up the dreaded Death Star, before Princess Leia called for aid from an old war hero, before the Rebel Alliance crystalized into a force that would bring down a Galactic Empire, there was Phoenix Squadron. They were a band of rebels who fought against the Empire in the Lothal sector, tucked away in the outer rim of the Star Wars galaxy. Thanks to the crew of the Ghost from Star Wars Rebels, they acheived great success. Still, Phoenix Squadron has enemies. With the increased Rebel activity in the Lothal sector, the Emperor has sent one of his most trusted and efficient servants, the dreaded Grand Admiral Thrawn, to hunt down and destroy Phoenix Squadron. Sensing profit from chaos, the pirate Hondo Ohnaka hides on the edges of the conflict, more than willing to assist the side with the deepest pockets. 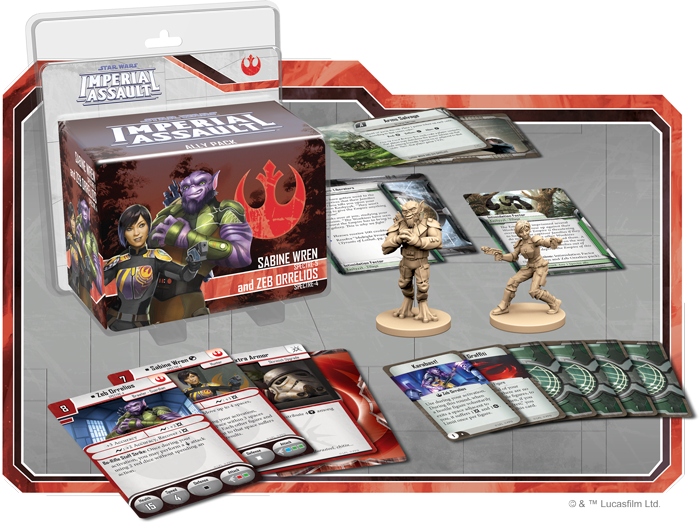 These figure packs contain everything you need to add these heroes and villains to your Imperial Assault campaign and skirmish games! Daring missions, powerful command cards and beautifully sculpted figures await you in each of these packs! 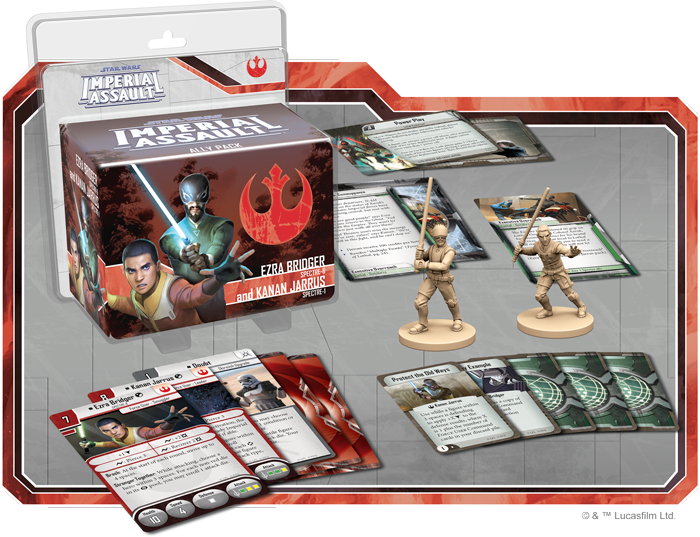 These figure packs will release alongside Tyrants of Lothal, and they work in conjunction with the mini-campaign found in that expansion. For more information on Tyrants of Lothal, click here. Kanan’s experience in the ways of the Force can add a tactical advantage to your missions. At the start of Kanan’s activation, the Imperial player selects one Imperial group—that group must be activated next, if able. This decision gives Kanan vital information, as he knows which ready Imperial groups he can safely ignore, and which ones are activating next, giving him important potential targets. Contrast this with Ezra Bridger’s brashness, which allows him to move up to four spaces at the beginning of each round. While he does not have the foresight of his mentor, his pure speed can get him into the perfect position at the start of a round. Welcome these Force users into your campaign with the Ezra Bridger and Kanan Jarrus Ally Pack! While some of the Spectres rely on their connection to the Force to aid the Rebels, others rely on their skills and technology. The Sabine Wren and Zeb Orrelios Ally Pack gives you access to two characters with a long history of combat. A former member of the Lasan Honor Guard, Zeb Orrelios is the muscle of the Spectres, taking down foes with his mighty bo-rifle. One of the few survivors of the destruction of his homeworld by the Empire, Zeb gives all he has in the fight against tyranny. Zeb’s bo-rifle is a powerful tool that can allow him to take down enemies very quickly. Once per turn, he may use it as a melee weapon, making a free melee attack with two red dice. This makes Zeb an extremely efficient brawler, able to perform both melee and ranged attacks with ease. Sabine Wren, a former bounty hunter, is one of the biggest assets that the burgeoning Rebel Alliance has. She's not only a source of hope in the darkness of the galaxy, but also an extremely effective soldier trained in the Mandalorian ways. 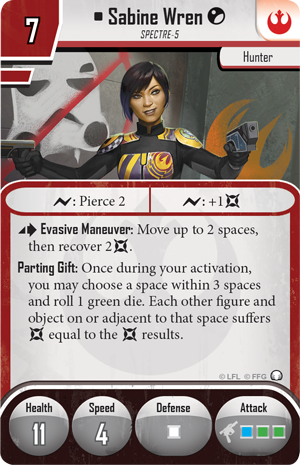 As an action, Sabine can take evasive maneuvers, moving up to four spaces and recovering two damage, making her a target that's difficult to hit. 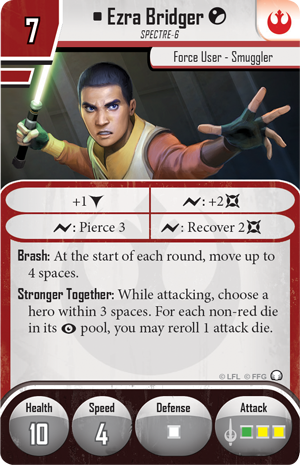 With three dice rolled for a ranged attack, Sabine can quickly make her away across the map, damaging any target she chooses with either a ranged attack or a final Parting Gift. While convincing these warriors to assist you will take some effort, your mutual connections in the Rebel Alliance may soon see you fighting side-by-side in the name of freedom. With the Spectres on your side, it may seem as though you're invincible. With the backing of the Rebel Alliance, surely you can rise against the Empire and bring freedom to the galaxy. However, on the planet of Lothal, there is an enemy even the Spectres have little chance to overcome. 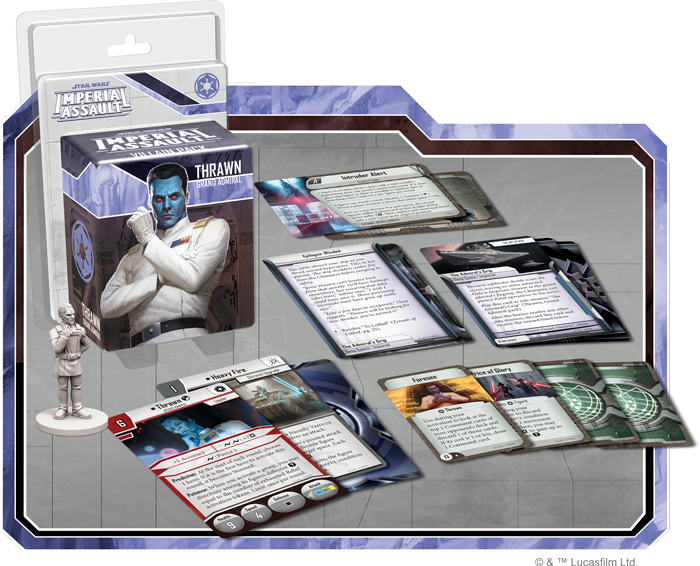 Grand Admiral Thrawn is one of the Empire’s brightest minds, and with an order to destroy the Phoenix Squadron, nothing will stand in your way with the Thrawn Villain Pack. 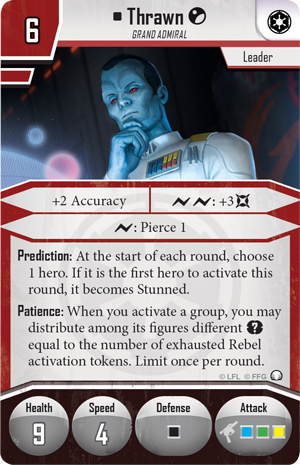 Thrawn’s impact is felt in the game at the very start of the round. The Imperial player may choose one hero, and if that hero is the first to activate, it becomes stunned. 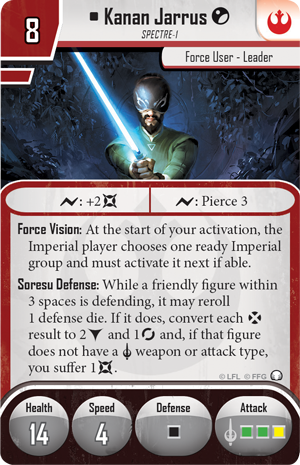 Thrawn’s bold predictions can shake up the Rebel players' plans, penalizing a hero who wants to escape quickly before you have an opportunity to activate your own forces. No matter what heroes dare to face the might of the Empire, few will be able to overcome Thrawn’s tactical mastery. Heroes, villains, rebels, empires… these distinctions make little difference to the respectable businessman Hondo Ohnaka. 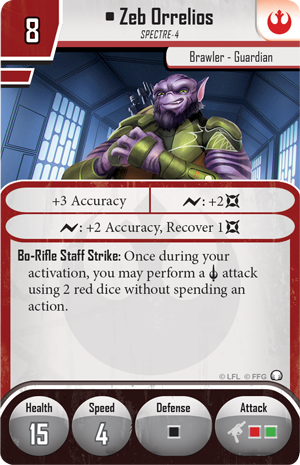 Hondo can be a dear friend or a frightful enemy, depending on the size of your pockets. 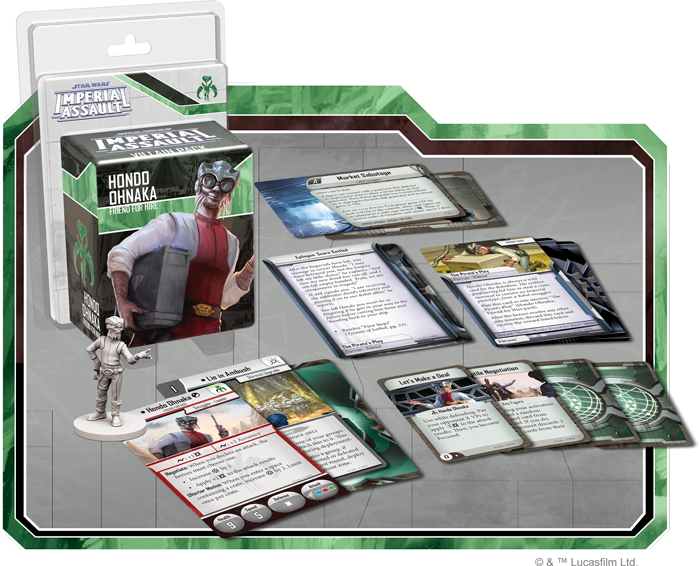 You can make a profit for yourself with the Hondo Ohnaka Villain Pack! Whenever Hondo declares an attack, the heroes must choose to either increase threat by two or increase the damage of the attack. Furthermore, Hondo increases the threat by two whenever he enters a space with a crate. 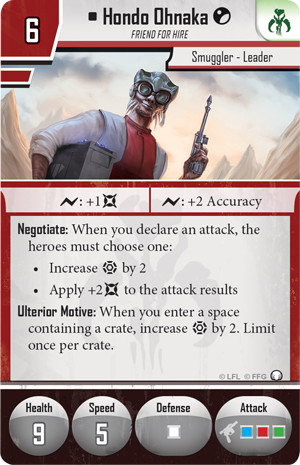 With these abilities, it’s clear that Hondo is a harbinger of things to come, pushing up the threat and allowing the Imperial player to deploy ever more dangerous groups to fight alongside him against his foes. The Lothal system is a powder keg ready to explode. While the Spectres and the rest of the Phoenix Squadron have had some success in undermining the Galactic Empire, the stakes have been raised. Grand Admiral Thrawn has arrived, and with him, the threat of the Rebel Alliance being wiped out. In the midst of this chaos waits a pirate hoping to make a profit. The Spectres are strong, but can they stand up to Grand Admiral Thrawn and the tyrants of Lothal? Find out and pre-order the Ezra Bridger and Kanan Jarrus Ally Pack (SWI55), the Sabine Wren and Zeb Orrelios Ally Pack (SWI56), the Thrawn Villain Pack (SWI57) and the Hondo Ohnaka Villain Pack (SWI58) from your local retailer! You can learn more about the Tyrants of Lothal expansion here.